Team Kwagga has been keeping a low profile since the previous event at Polokwane 4 weeks ago. Arno did however have a good practice session last Saturday and reports that all is good in Kwagga-land! I received confirmation from Bilstein that our new super-woed-woed Bilstein dampers with integrated hydraulic bump stops were couriered out of the UK on Tuesday, yeah baby! 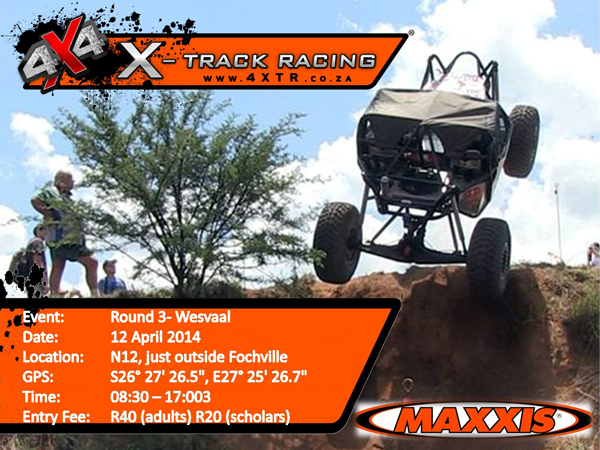 We won’t have time to participate with them next weekend at the Wesvaal event near Fochville as we expect some setting-up might be needed, but we really look forward to this next big step in suspension performance! Attached is a flyer with info on the next event on Saturday 12 April, we hope to see lots of our friends and supporters out there! Because of really bad planning, I will be in the Kgalagadi north of Upington in the middle of a two week holiday next weekend when the event takes place! Because I am really serious about the Championship, I fly home from Upington on Friday, do the event on Saturday and then fly back to Upington on Sunday to carry on with the holiday, yeah baby! Like I mentioned in the previous newsletter, things are pretty tight on the leader board in our class after the first two events! At the front of the leader board we have Roelf and his son Shaun (2013 Champion) in joint first position on 56 points followed by Raymond (Roelf’s other son) and Team Kwagga in joint 3rd position on 55 points! In other words, after two events, a single point covers 1st to 4th position overall in our class! That makes for very competitive racing in our class, come and share in the drama!